The welcoming reception measures 3,727sqft (346sqm), and inhabits the top floor of the building, with the challenge to maintain the openness of the space to the adjacent roof garden, while creating a comfortable and inhabitable environment that would support staff and visitors alike. Bean Buro proposed an open and interactive space, with a 9m long LED screen displaying dynamic abstract animations to create a museum-like experience, referencing artistic conversions of industrial spaces. 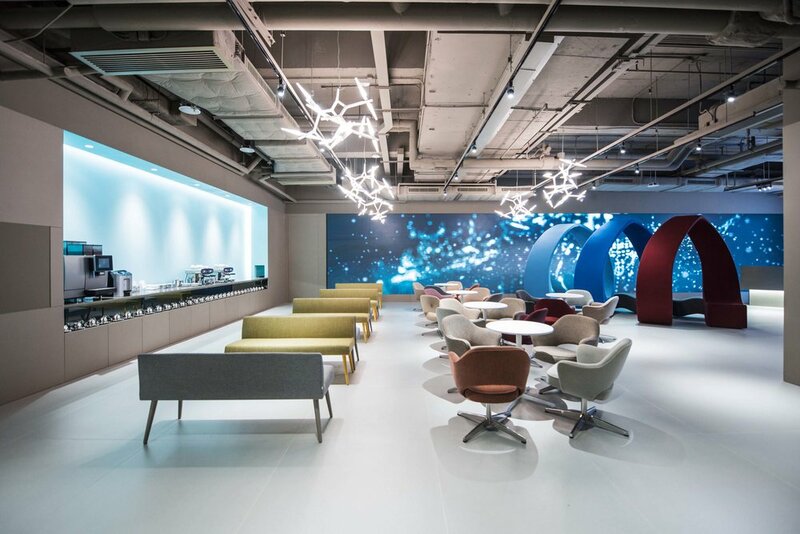 An open, flexible café space forms the social hub of the company and acts as a welcoming area for guests. Sculptural furniture and original Eero Saarinen chairs from the 1950’s providing a backdrop to the everyday experience of the office. The space was designed to be flexible, with a meeting rooms that can be opened up for events, or closed for private meetings, moveable furniture to easily change the configuration of the space. Gallery style lighting and backlit rear walls of translucent glass enhance the legibility of the space. Bean Buro used high quality oversized ceramic floor tiles, designed by French product designers Ronan & Erwan Bouroullec, to create an earthy and textured flooring.